A must have for trip planning, it's the one our staff uses. This map shows every permanent track within the country, BUT the road conditions are unpredictable. Cute reindeer on the cover. Not a map so much as a guide. Routes and details overlaid on a superb satellite image of Khovsgol. Plenty of background information and natural history details. 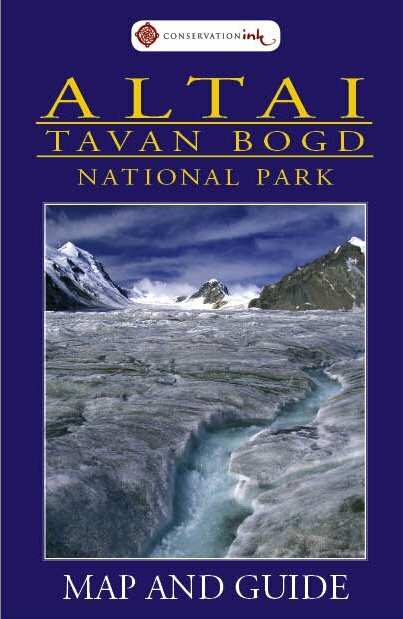 Altai Mountains and western Mongolia.. Plenty of background information and natural history details. "On the steppes of Mongolia, even today, there are more horses than human beings. And both are nomads, together roaming the vast countryside. This film describes their everyday life and looks at the traditional role of the horse in Mongolian society." We have several copies of this EXCELLENT video in VHS or DVD. ALL horse lovers will find this hour-long video fascinating. It is the best introduction we know of to Mongolia. 1 week rental $15.00 USD includes US/Canada postage. Security deposit required. 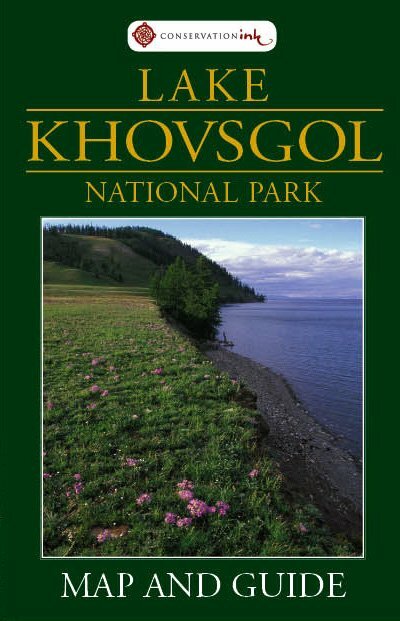 In Fall/Winter of 2002, our friend and neighbor, Gordon Wiltsie went on assignment for National Geographic Magazine to document the annual migration of Mongolian nomads from the Darhad Valley to the shores of Lake Khovsgol. 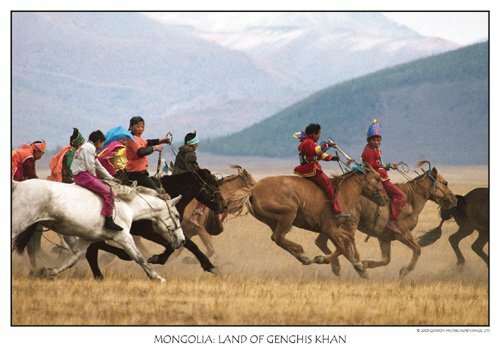 After two challenging months of living and riding with nomads, "Mongolian Crossing" (October 2003 National Geographic Magazine) was the result. Boojum Expeditions is proud to have been selected by Gordon and National Geographic to provide the planning and logistical support needed to fulfull the assignment. FINE ART PRINT ALSO AVAILABLE! in limited edition of 200. 11x14 matted $185.00 plus shipping, 16x20 matted $235.00, 20x24 matted $310.00. Call for details. This "little brain" as it's name implies is a must for anyone interested in Mongolian language! Simply type in the English or Mongolian word and get an instant translation. It's functions include Calendar, Calculator, Address Book, Memo, Games and Money/Measurement Converter. Formerly reserved for those who have traveled with Boojum Expeditions. Now available to the general public by popular demand! Chose either two/tone breathable cotton (left above) or heavier waxed duck (great for rain, right above) each features the Boojum logo. 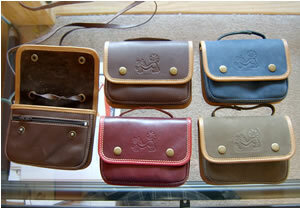 Logos are stitched in a variety of colors, call if you have a special preference and see what's in stock. 100% Cotton heavy duty Jerzee T-shirts, sizes Large and X-Large only. Basic gray T-shirts compliments any wardrobe. Special offer: Send us a verifiable police mug shot of yourself in your Boojum shirt and win a new shirt a year for life. Two shirts a year if the mugshot is from the police station in Lhasa. These bags are good for a night out at the opera on Sukhbaatar Square or to tuck under your raingear enroute to the taiga. Made in Ulan Bator to our specifications, they fit a cell phone, a passport and tickets or a couple days supply of dried cheese. 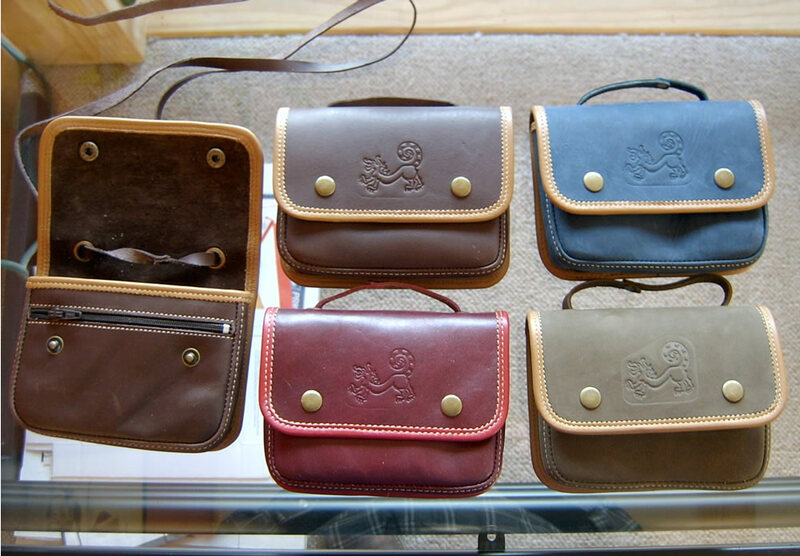 The leather and workmanship is excellent. 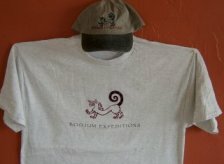 Adorned with the embossed Boojum Expeditions logo (eat your heart out, Louis Vuitton). Indicate monochrome or two-tone (every one unique). Click picture for detailed image.